Photo credit: ABC News. 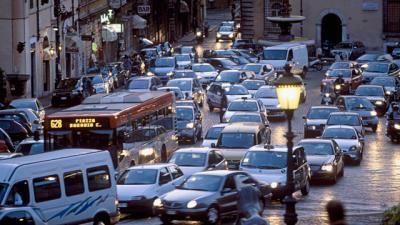 The streets of Rome, which have seen high levels of traffic volume in recent years. ROME - An amendment establishing a bonus-malus system on car registration, that is dependent on CO2 emissions, has been approved by the Italian Budget Committee. It is reportedly a major cause for concern for car manufacturers and dealers alike. The amendment, which will be valid until 2021, foresees a registration tax on new cars that varies between 150 and 3,000 euros, and an incentive for hybrid electric cars that varies between 1,500 to 6,000 euros. According to industry experts, the car market will risk losing momentum upon the amendment's implementation, as the prices of vehicles will undoubtedly increase. Some models of the Fiat Panda, the most sold vehicle in Italy, and the Fiesta will cost an additional 400 euros, and the average price for the majority of vehicles will increase by over 300 euros. An increased sales potential can only be guaranteed for Italy’s 150 thousand electric and hybrid cars, which form just 8.5 percent of the market. The taxes however will hit around 1.35 million buyers. “On the other hand, a sector which is already making large sums of money will continue to be rewarded."